Haryana Steelers showed their all-round mettle as they beat Jaipur Pink Panthers 30-26 in a Pro Kabaddi League Season 5 match on Thursday. Haryana Steelers showed their all-round mettle as they beat Jaipur Pink Panthers 30-26 in a Pro Kabaddi League Season 5 match on Thursday. Wazir Singh scored 10 points while Surender Nada secured five tackle points for Haryana Steelers. Jaipur Pink Panthers were let down by their defence as they made too many errors and allowed Haryana to score raid points at will. Haryana Steelers remain in the second spot in Zone A table with 54 points from 17 matches. Jaipur Pink Panthers are fifth with 36 points from 12 matches. 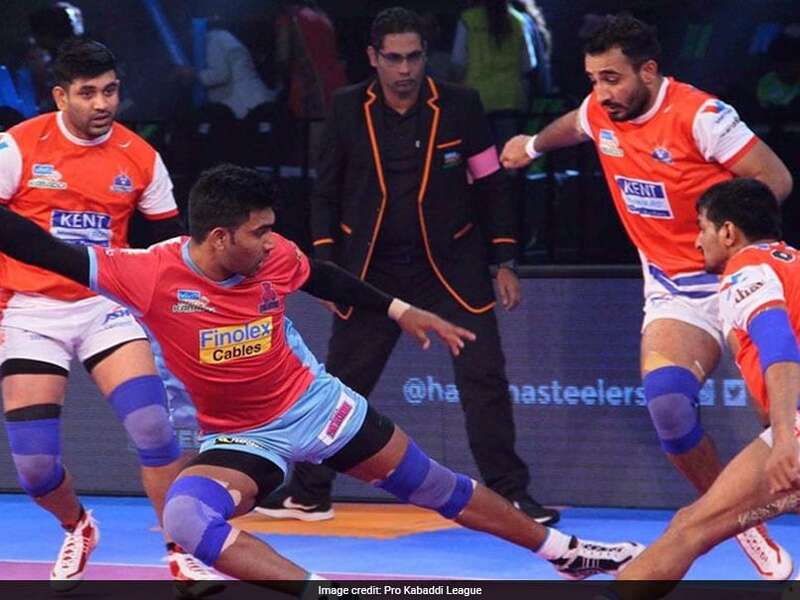 Wazir Singh opened Haryana Steelers' account in the first minute with a successful raid. Pawan Kumar made a successful raid in the third minute as Jaipur Pink Panthers tied the match at 2-2. Jaipur led 4-3 in the fourth minute as they sent Surjeet Singh to the bench. In the next few minutes both teams exchanged raid points as Haryana Steelers led 6-5 in the ninth minute. Two tackle points were scored by both teams to tie the match at 8-8 after 12 minutes. Tushar Patil scored with a three-point raid as Jaipur Pink Panthers led 11-8 in the 15th minute. Haryana Steelers scored four points in two minutes as they went into the break level with Jaipur Pink Panthers at 12-12. The second half began with both teams scoring two tackles point each to level the match at 14-14 in the 24th minute. Haryana Steelers took control of the match from the 25th minute as first Ashish Chhokar scored with a two-point raid to give them 17-14 lead. In the 27th minute, Haryana Steelers inflicted an all out to lead 22-16. In the span of five minutes Haryana scored 10 points in response to Jaipur's two points as they led 24-16 after 29 minutes. Pawan Kumar tried to take Jaipur back in the game as he came up with a super raid in the 32nd minute. But Haryana Steelers were in no mood to relinquish their lead as they scored a couple of points to lead 29-22 in the 35th minute. Jaipur Pink Panthers scored four points in the last couple of minutes but it was a case of too little too late as they lost 26-30.